of splenectomy is atelectasis (collapse) of the left lower lobe of the lung. Thrombocytosis (i.e, increased number of platelets within the blood) is common postoperatively; anticoagulation therapy may be necessary to prevent spontaneous thrombosis. Abnormal RBCs with bizarre shapes, some of which contain Howell-Jolly bodies (nuclear remnants), are found in the blood postoperatively. B. Overwhelming postsplenectomy sepsis. After splenectomy, patients (especially children) are at great risk for bacterial septicemia because of decreased opsonic production, decreased IgM levels, and decreased clearance of bacteria from the blood. The pathogens most commonly involved are Streptococcus pneumoniae, Haemophilus influenzae, and Neisseria meningitidis. Patients with sickle cell anemia usually undergo "autosplenectomy" because of multiple infarcts caused by stagnation of abnormal RBCs. Therefore, these patients are prime targets for postsplenectomy sepsis. Clinical signs include: influenza-like symptoms that progress to high fever, shock, and death. C. Hypersplenism is increased splenic function (i.e., not to be confused with splenomegaly, which is increased splenic size). Clinical findings include: anemia, leading to pallor and fatigue; leukopenia, leading to increased susceptibility to infection; thrombocytopenia, leading to easy bruising and nosebleeds; and a compensatory increase in bone marrow activity. Hypersplenism may be caused by hematopoietic disorders (e.g., hereditary spherocytosis, thalassemia) or immune disorders (e.g., immune thrombocytopenic purpura). 1. Hereditary spherocytosis is a genetic hematopoietic disease characterized by a deficiency in the spectrin protein that helps to stabilize the RBC membrane and usually is caused by a mutation in the gene for ankyrin. Hereditary spherocytosis results in anisocytosis (variation in the size of RBCs) and spherocytes with no central pallor zone. Clinical signs include: anemia, fatigue, jaundice, pigmented gallstones, and splenomegaly. 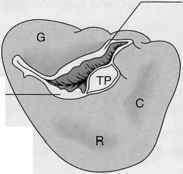 Treatment is splenectomy. 2. Immune thrombocytopenic purpura is an immune disorder in which circulating antibodies (IgG) directed against platelet-associated antigen cause rapid destruction of platelets. Clinical signs include: low platelet count, easy bruising, petechiae, mucosal bleeding, menorrhagia, and increased megakaryocyte count. 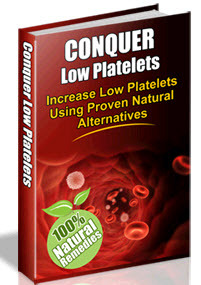 Treatment includes: steroid (e.g., prednisone) administration, platelet transfusions, and plasmapheresis. Splenectomy is recommended if steroid administration is ineffective. 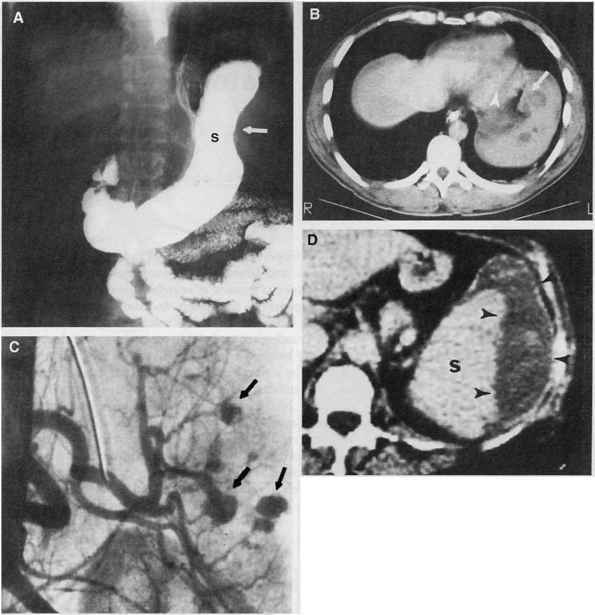 D. Splenic vein thrombosis most commonly is associated with pancreatitis. Clinical signs include: gastric varices and upper gastrointestinal bleeding. III. RADIOLOGY. Anteroposterior barium radiograph of splenomegaly, computed tomographic (CT) scan of traumatic spleen rupture, aortogram of traumatic spleen rupture, and CT scan of traumatic spleen rupture (Figure 11-2). 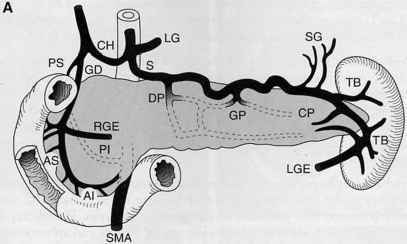 What veins and arteries are located by the body of the pancreas?